Bad Wildungen lies in the eastern foothills of the Kellerwald range in the so-called Waldeck holiday region (Waldecker Land), 11 km west of Fritzlar and 40 km southwest of Kassel. The famous Spa town is one of the most exciting 'pearls' of the new 'Discovery Region Edersee'. Of course, you should have a look at our special WebSite , which is available in English, too. The town, which spreads out east of the Homberg (518m), is crossed by the river Wilde, which empties into the Eder. 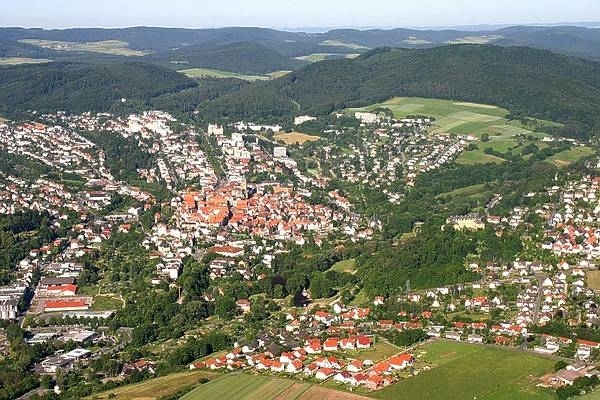 The constituent communities of Wega and Mandern lie on the Eder, on which also lies the Edersee, a reservoir lying only about 10 km northwest (in a straight line) of the main town of Bad Wildungen. The river Urff flows through the southwest constituent communities of Hundsdorf, Armsfeld and Bergfreiheit. The nearest large towns are Kassel (about 40 km, northeast), Marburg (about 60 km; southwest) and Korbach (about 30 km; northwest).